Our product line is very diversified and specific application questions and answers are quite common. Therefore, we do not utilize a Shopping Cart format. To best serve you, please take a few moments to call our Toll Free Order/Info Line 1-800-695-0158 (M-F 8am - 6pm Central Time) with your order or info request. Our friendly staff will thoroughly address your questions and ensure you purchase the appropriate products to best satisfy your needs.Thank you for shopping with JMH Motorsport.com. Morgan Holt, President. JMH MOTORSPORT, a division of JMH Associates, Inc., is owned and managed by J. Morgan Holt, II. We have been active in the automotive, truck and RV/ Motorhome industry since 1989. Our Headlight Saver and Paint Protection products have been marketed both wholesale and retail. The motorcycle industry asked for our Headlight Savers in early 1995. 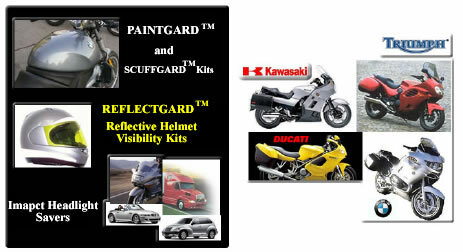 As a result of this marketing success and many dealer requests, our REFLECTGARD, PAINTGARD and SCUFFGARD motorcycle product line was developed. Our motorcycle product line has applications for BMW, Honda, Ducati, Triumph, Kawasaki, Suzuki, Yamaha and Moto Guzzi. We pride ourselves on quick response to consumer interests and requests regarding our product line as well as new product applications. Basically, if a market potential exists, we will respond quickly with product. At JMH Motorsport we subscribe to the “if you don’t see it, just ask” philosophy of doing business. Our products are precision crafted by computer for model specific application using the best 3M and other premium automotive grade materials available on the market. Bulk materials are available for those wishing to fabricate for their own needs. JMH Associates, Inc. is proud to be an OEM supplier to BMW North America (Motorcycle Authority Division), Aprilia USA and Motolight Halogen Riding Lights. Dealer inquiries are welcome and encouraged from both franchised and independent operations. Click here to view all of the Diamondite products sold at jmhmotorsport.com!